There’s no doubt that hiring remote workers has its benefits. For example, remote workers don’t have to commute. They don’t spend precious company time getting caught up in water cooler gossip. They only bill you for hours they actually work. And, reports indicate that remote workers are happier overall than those in the office. While there are plenty of perks to having remote workers on your team, when they are not in the same location as you, it can be difficult to help them effectively manage their time. To help you get more mileage out of remote workers and make sure they have the right tools to stay on task, here is a list of the best time and task management apps for 2019 for remote workers. 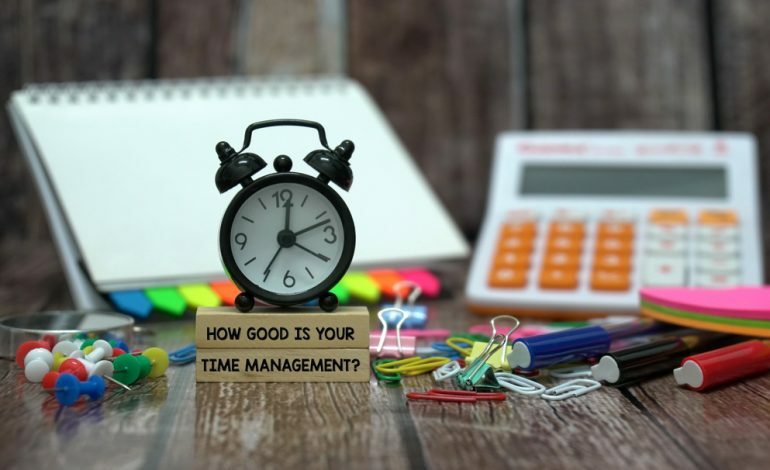 There are several pieces of the time management puzzle, and this article will suggest apps to help you with each facet of time management. But, let’s start with the most obvious—time tracking. Time Doctor is one of the leading time tracking apps available today. Their customers include large corporations like Apple, Home Depot and Verizon as well as SMBs like Surveymonkey and Firehouse Subs. Time Doctor helps you accurately track where your remote employees are spending their time and it ensures they are working efficiently. This app tracks the total time your team members are working as well as giving a breakdown of how much time they spend on certain projects, tasks and clients. Time Doctor has a very simple and efficient way of tracking time. Employees have to start a timer whenever they start working on a task. They can name the task they are working on, which in turn are part of projects that managers set for them. This gives you a clear idea of which tasks and projects employees have been spending their time on. 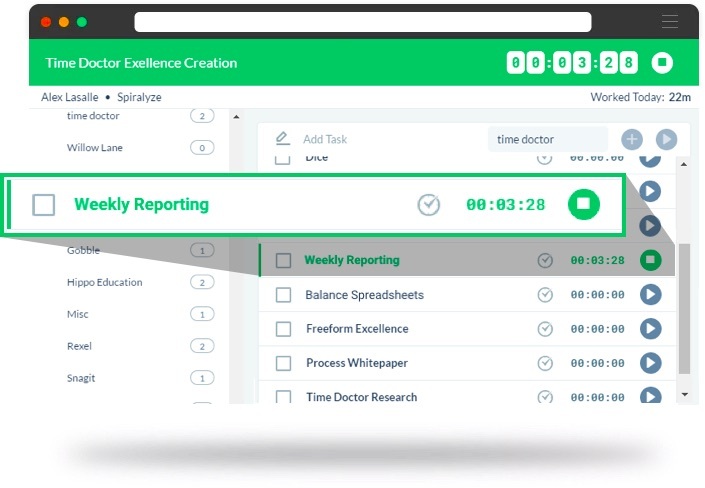 Time Doctor is accurate to the second – ensuring efficient, error-free time management. Time Doctor tracks what websites and applications team members are accessing during work hours to give managers a better understanding of where they are spending their time. To ensure privacy, Time Doctor does not track web activity while employees are not running it. Time Doctor also offers the option of screen monitoring. Managers have access to screenshots of the employee’s current work activity that were taken at random intervals. For safety purposes, employees may delete these screenshots in case they were accidentally running Time Doctor during their personal time. 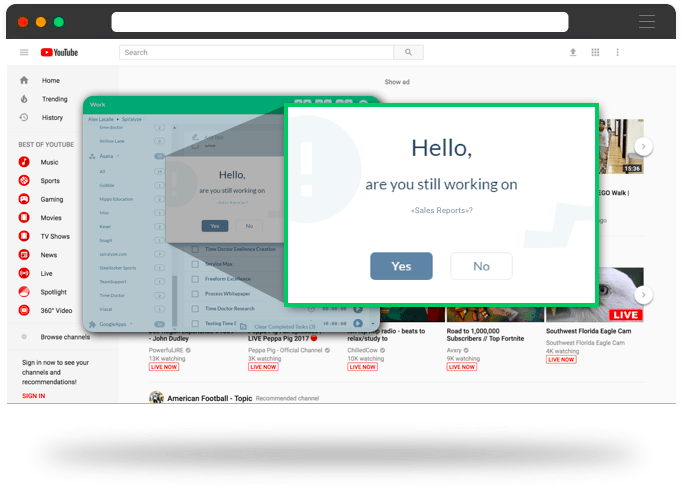 When you access any social media or entertainment website during work hours, TimeDoctor generates a popup – asking you if you are still working. Weekly poor time usage reports are also generated with a list of the distracting websites and applications used. Time Doctor creates automated reports of a member’s time usage. There are different reports like Timesheet reports, Time Use reports, Attendance reports, project-based breakdowns, Web and App Usage Reports that show time spent on certain activities and websites. It offers you full customization over the parameters of these reports – be it for a certain individual, group, or time period. Time Doctor has a dedicated API with multiple integrations with tools like Asana, Todoist, and Slack. Extremely feature-rich and accurate time tracking application. Several features to ensure that timesheet records reflect time actually spent on tasks and not exaggerated. Advanced measures of privacy to ensure no employee monitoring when they aren’t on the job. Web and app monitoring features can be disabled for certain team members if required. Clients can have access to records if needed. Geared towards teams, rather than individuals such as freelancers or solopreneurs. Time Doctor costs $9.99/month per user. You can even sign up for a 14 day free trial without using a credit card. Roadmap is another useful time tracking app for remote employees, especially if you are in charge of balancing and monitoring the schedules of lots of remote workers. Roadmap gives you cross-portfolio views of all of your remote workers, so you can see where your workers are under-scheduled or have too much on their plates. You can also see how your project goals are lining up with the realities of your resources and staff, and make adjustments accordingly. Roadmap allows you to easily manage your team’s operations from a centralized dashboard. You can organize your resources according to various criteria and filter search results. With Roadmap, you can view the status of your operations as per your preferences. You have access to granular pivot tables – broken down by tasks, resources and deadlines. Roadmap can also share current snapshots of your progress with clients and team members. Roadmap grants you access to cross-portfolio Gantt charts to communicate status updates with your team members. Along with time tracking, you can set up automated notifications for your team members, as well as non-Roadmap users in your network as well. Roadmap has integrations with multiple platforms like JIRA, Basecamp and GitHub along with a dedicated browser extension. Cloud-based planning program hosted by Amazon’s reputed EC2 platform. Multiple security and privacy safeguards kept in place. No mobile Android or iOS app. Very basic time tracking software. Geared towards teams – freelancers won’t have much use here. Roadmap offers both monthly and annual subscriptions where you can save 16.7% on opting for the annual version. The prices range from $99 for the basic model to $1175 for the unlimited model on a monthly basis. All plans come with a 30 day free trial. Once you have a way to track time, video conference with your remote workers, and chat with your team members, it’s time to find some tools to help with project management. After all, it does little good to track time and locate inefficiencies if there is no way to improve on your productivity methods. ClickUp is a powerful cloud-based project management software that is suited to all types of teams and businesses. ClickUp provides you with all the features you need to ensure that your entire company’s projects and tasks run smoothly on a single platform, rather than have multiple tools for different teams like engineering and marketing. ClickUp reduces the need for any other third-party tool to organize your work as it acts as a centralized platform to cover all management aspects. With features like multiple viewing options, advanced team collaboration setups and a hoard of integrations, ClickUp is a one-stop solution to all your team management needs. ClickUp offers several task viewing options to suit everyone’s personal preferences – they offer list, box, calendar and board views to cater to your personal needs. Each workspace can be viewed in a different format with just a single click – giving you different perspectives about the status of your projects. ClickUp allows your team to make comments on each task to share their views and updates. Additionally, ClickUp offers your team the option of creating customized checklists, statuses and notifications to note down what they’ve done and what’s left. With ClickUp you can organize your teams and tasks according to different levels of hierarchy – company, team, project, task, subtask, etc. You can assign particular tasks to people, to be sorted into groups, which can then be sorted into categories. ClickUp also offers you a multi-task toolbar to make edits to as many tasks as you want with ease. ClickUp has dozens of integrations such as Slack, Google Drive and Todoist . You can also set up 1000+ integrations with Zapier to make the most of your productivity. A single team for the entire company that can be used by different teams like sales, marketing, engineering, support and so on. One of the most feature-rich project management tools and releasing a new feature nearly every week. Highly customizable to suit varied needs of startups to large companies. Fully functional desktop, Android and iOS apps. Storage options on their free plan are minimal. ClickUp’s free plan offers access to unlimited projects for unlimited users with 100Mb of data storage. For $9/user/month ($5/user/month if billed annually), you get unlimited storage, integrations and advanced reporting. Basecamp works by organizing all important tasks into three categories and displaying them all on one convenient dashboard. They can access sections pertaining to the company as a whole, their peers, or even their tasks in particular – creating an ordered approach to resource management. Basecamp makes it easy for you and your team to coordinate with various features to make effective communication easier. With message boards, you can focus on a topic where you can embed images, documents, and links for discussions. Basecamp also offers a dedicated real-time chat room that can be separated into several channels. There is also a direct message (Ping) feature to communicate 1-on-1 with team members. Basecamp allows you to make to-do lists for each member in your team and even assign tasks to particular groups with deadlines. You can add notes and attachments to each of these lists and even comment directly for added information. Additionally, Basecamp offers you full control over scheduling by integrating it with Google Calendar/Outlook/iCal. Basecamp ensures that every project has a space to share and edit files through their cloud storage facility. Basecamp also provides a specialized client-centric platform to cater to your clients where you can directly email them or send them updates from Basecamp. Basecamp gives you ready access to detailed reports about all the operations going on in your team. You will know who’s performing what, what has been completed, or what is coming up. Basecamp’s Hill Charts feature is useful for measuring task progress over time. Basecamp offers you multiple integrations across all formats. They provide integrations with desktop apps like Zapier, time trackers like TimeDoctor and software development apps like ScrumDo. Bookmarking facilities to highlight important tasks, lists and documents. Multiple themes to customize your experience as per your preferences. The UI and approach to project management are dated. Mobile apps lack the extensive functionality of their desktop application. No inbuilt time tracking tool. For a subscription of $99 per month, you can use all of Basecamp’s features for unlimited projects and users along with 500 GB of file storage. They also offer a 30 day free trial. 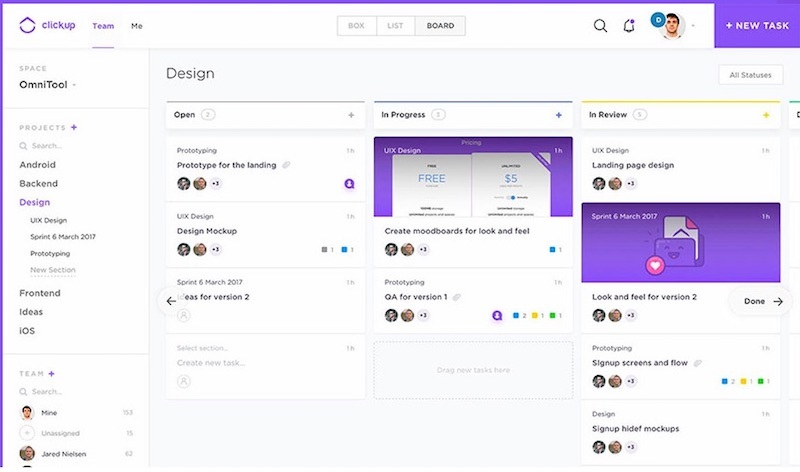 Asana is a straightforward and simple project management app. With Asana, you can break down tasks into either a list or a calendar. That way, you can see exactly when you have something due on a calendar, and tackle them in an orderly fashion. 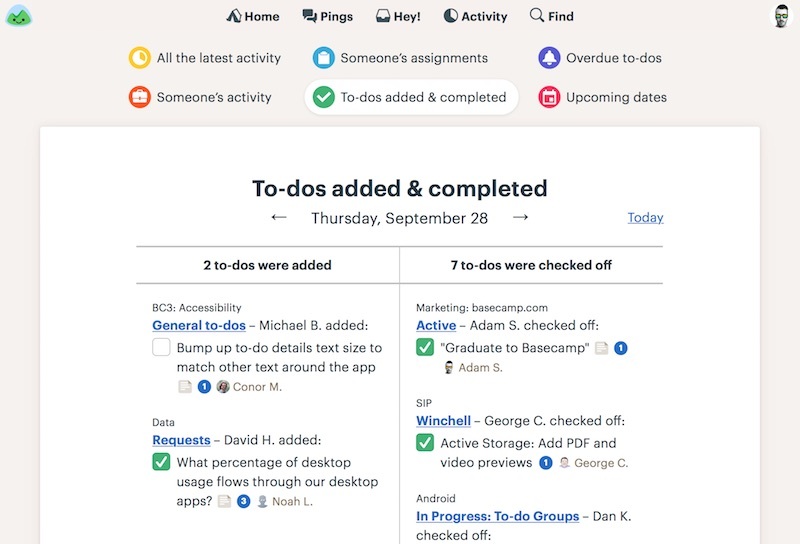 Asana also allows you to organize your tasks with tags like “complete,” “incomplete,” “tasks by due date” and “tasks by project.” This enables the manager to see how progress is coming along and allows the remote worker a way to quickly sort out what has been done and what still needs to be done. Asana allows your team to make notes and comments on a task for further clarifications. There is also a dedicated team page for conversations within the group, and an option to share status updates with stakeholders. Asana allows you to create teams and groups and integrate them with a common team calendar for status updates and notifications. You can also tweak the privacy settings to limit access to certain files for some team members if needed. With Asana, you can create timelines to visualize how far your team has come in completing a task. 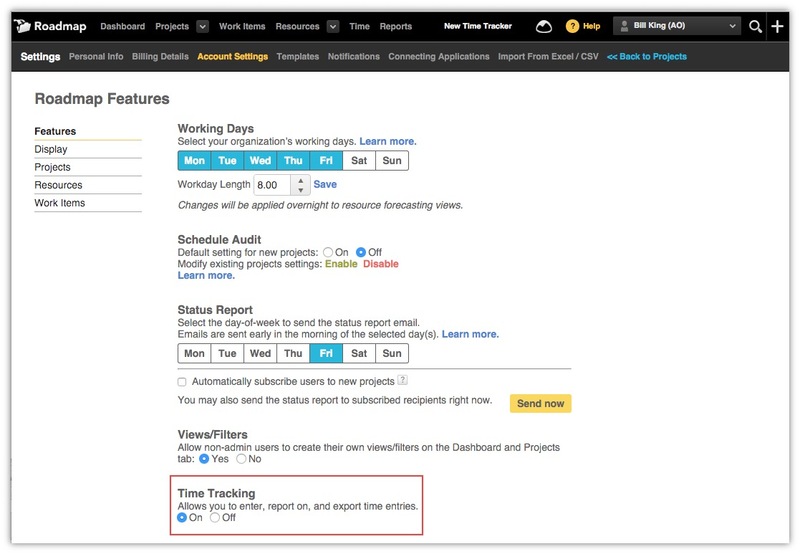 You can also integrate calendars to set deadlines, notifications, and make adjustments to schedules with the click of a button. Asana has over 100 integrations such as Dossier, Microsoft Office and Zapier to make tracking your team’s progress easier. To enhance reporting and exporting capabilities for Asana, you can check out Bridge24 for Asana. Fast and efficient tool as per user reviews. Progress reports are very basic. The tool is not very flexible in terms of visualization options. Only 15 team members can use the free version. 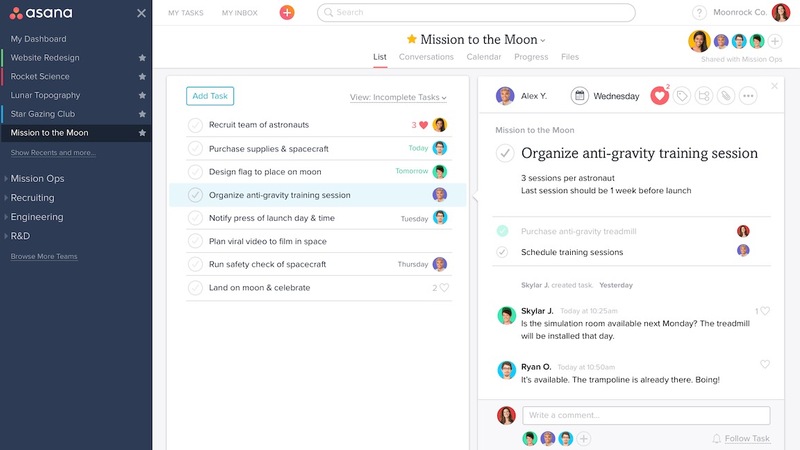 Asana’s free version allows for unlimited projects, tasks and conversations for teams up to 15 members. 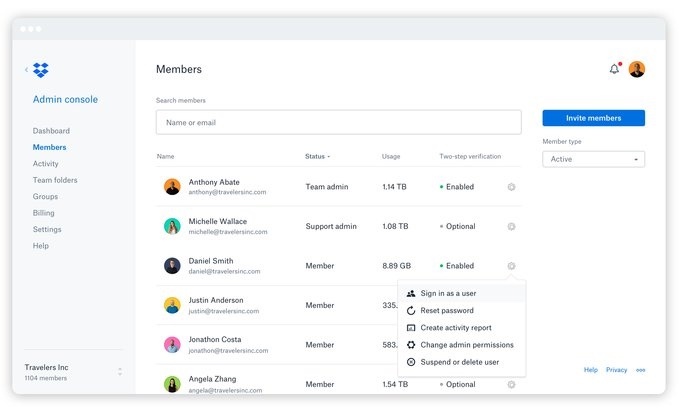 For $9.99 per user, per month, there is no member limit along with a list of other features like advanced search and reporting, admin control and Google SSO Support. It has an easy click and drop scheduler that helps you visualize team workload, easily assign tasks, make updates quickly and find the remote worker you are looking for with its sort and search feature. You can also organize projects by assigning tasks, marking milestones, grouping projects and adding notes to ensure that you are hitting your goals. Float offers you extensive project management features with the ability to assign tasks, add project notes and define milestones for your project. You can also assign project managers and group tasks into categories. Float allows you to keep track of your team members and their respective job titles, availability, and any assigned tags. You can also keep track of what projects they’re working on and limit their access to certain files if the need arises. Float provides advanced reporting features to get an in-depth analysis of how your team is performing. You have access to track how your team is utilizing their hours and compare their performances. SSL security with daily backups to ensure that your data is safe. Functional desktop and iOS application. Flat rate of $5 per user per month for all the features. If you pay annually, you save 15%. ProofHub puts all the right tools your team needs in one place without having to invest in several of them to manage projects and collaborate. It helps to plan what needs to be done, discuss ideas, organize documents, deliver projects of all sizes and get more done in less time. This way, managers know what the team is working on, the team knows what they need to do and the clients stay in the loop with no sweat, in a single, streamlined place. 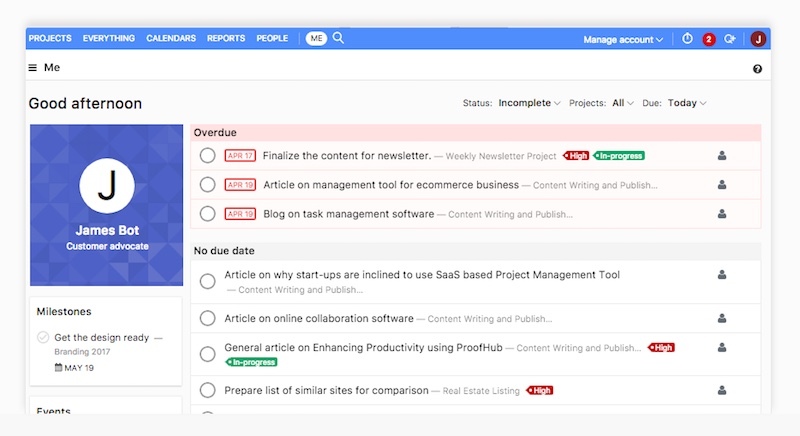 ProofHub offers extensive task management capabilities. 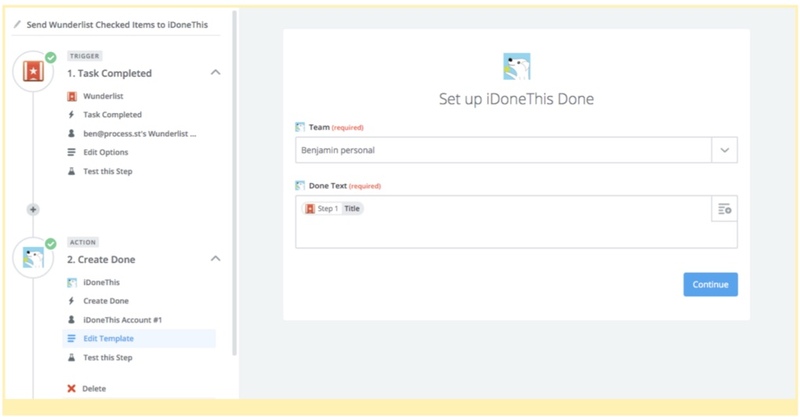 You can assign tasks to team members and groups while creating checklists for them. You can also set up workflows and boards to manage various tasks within your team. ProofHub also has an inbuilt proofing app to speed up the review process. ProofHub allows you to assign custom roles to each member – allowing them varying levels of accessibility and responsibility. ProofHub has a discussions board for team members to share updates along with a chat application for more real-time conversations. You also have the option of integrating your team’s calendars to ensure that they are up to date with deadlines and notices. ProofHub offers you detailed insights about your ongoing projects and team members over time. There is also an automated logs system to record every activity that goes on in your team’s server. ProofHub API with multiple integrations with apps like Dropbox and Google Drive. Ability to restrict IP addresses outside of your network from accessing files. Functional desktop, Android, & iOS apps. Cannot set a recurring option for tasks. While they offer a flat $50/month plan with no cap on the number of users, their “Ultimate Control” plan for $99/month offers custom roles, activity logs, unlimited projects and 150GB of data storage. In addition to this, upon purchasing it annually, you get a discounted rate that works up to $89/month. Efficient communication is one of the most crucial pillars of productive team workflows. Even with the best time management apps, if you don’t take time to connect and actually talk to your remote employees, it’s impossible to stay on the same page. Getting on a video call can quickly convey a huge amount of information with high levels of clarity. When team members have clear guidelines and instructions, they work much faster and make minimal mistakes. Essentially they get far more done in the same amount of time. Moreover, managers also have to invest minimal time in supervision and checking their team’s work and can dedicate that time to more value adding activities like strategy, coordinating with other departments and so on. That’s why we included these top meeting and video chat apps to make communication a breeze for remote teams. Launched in 2013, Google Hangouts was Google’s answer to creating a video-meeting software for remote employees. Through Hangouts, your team can schedule a time to meet and chat through a video call. In addition to this, you have the option of a one-on-one chat or including your whole remote team in your Google Hangout. Not to mention, the app is completely free and available across all desktops and iOS/Android devices. Google Hangouts makes it easy to connect up to 10 people via video on their free version. With a paid G Suite account, you can seamlessly connect up to 25 people on video. Google Hangouts doesn’t require any additional plugins to run – you simply share a link to access the call via email or through messages. With a G Suite account, users can see scheduled meetings and even have access to a dial-in phone number – ensuring that they have access even without a steady Internet connection. 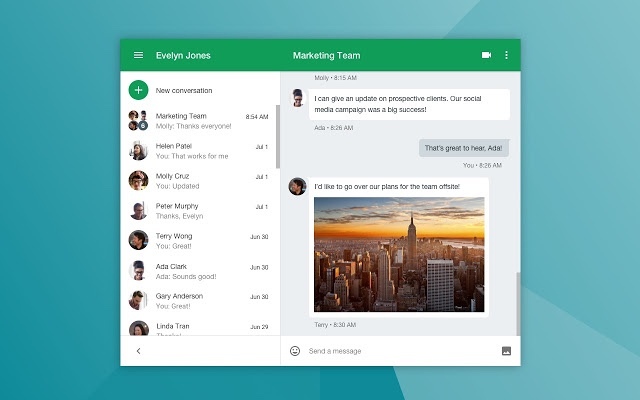 Hangouts also provides a text-based platform for instant communication between members. Hangouts can be readily integrated with other Google apps along with a host of other apps like Asana and Hubspot. Ability to record chat sessions. Minimum video lag reported by users. Fully functional apps on Android & iOS platforms. The free version is sufficient for smaller teams. Very little to offer other than video calling. Even the paid version may be too limited to suit larger teams. The free version of Google Hangouts may work for smaller teams as 10 people can connect over video call at once. For larger teams however, Google’s G Suite Enterprise account allows 25 people to connect at one go. G Suite Enterprise costs $25/month per user and has a host of other benefits on all Google apps. Skype is a good alternative to Hangouts that provides many of the same features and benefits. With over 300 million active users, Skype is another communication platform that both – the avid remote worker and the layman, are familiar with using. Skype allows easy messaging, voice calls, screen sharing, and video conference calls for your remote team and is available for use across all desktop, iOS and Android devices as well. Skype allows users to connect with fellow Skype members through computer-based audio and HD video calls. They also have access to an in-built dedicated instant messaging service. Skype allows you to schedule meetings on-the-go via your mobile device. You can also schedule meetings through their plugin on Microsoft Outlook or via their web scheduler. The web scheduler allows you to adjust the details about a meeting, send invitations, or even delete an upcoming meeting. Skype grants participants a host of interactive tools to enhance their video conferencing experience such as conducting polls and Q&As during the video call. You also have a whiteboard feature to freely discuss ideas and list down content. Skype allows you to broadcast content to over 10,000 attendees – making it easy to conduct large scale webinars. Skype allows the presenters and organizers to record various aspects of the call – be it audio, video,whiteboards, or screenshots, for future reference. Fully integrated with Microsoft Outlook. Ability to add contacts outside of your work organization. Ability to see statuses of all your team members. Fully functional desktop, Android, and iOS platforms. Free variant lacks many features and is more suited to casual use. Lack of extensive third-party integrations. 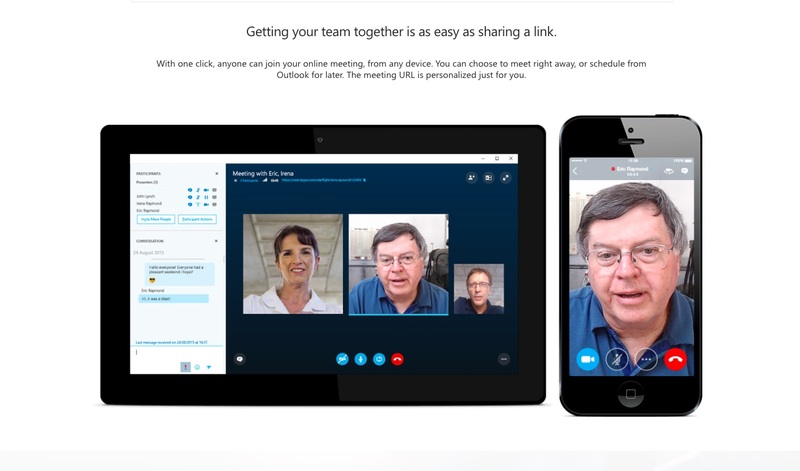 While the basic version of Skype is free, it only allows for 25 users to connect on a conference call and doesn’t have any additional features. Skype Business upgrades this to 250 users along with offering HD video conferences, desktop sharing and Outlook integration. Plans start at $2/month per user. Join.me provides the regular features you would expect in such an app like free conference calling capabilities, video conferencing, screen sharing and chat (through Slack). However, Join.me takes it a step further by providing additional benefits like webinar training services and a mobile whiteboard – something unique to this platform. Join.me offers video calling for up to three members on their free platform and up to 10 members on their paid variants. They also provide local conference call numbers for audio conferencing in the U.S and 50+ countries through phone or VoIP. Join.me makes it easy to schedule meetings with your team through their own in-built scheduler or Outlook and Google Calendar. Your team members will be informed of the same and can easily connect in an instant. Join.me offers their unique Whiteboard feature on their iPhone and iPad apps which allows individuals to share their ideas through means like pictures, drawings or documents. They also offer the facility to share these whiteboards on social media platforms like Facebook and Twitter. Join.me allows users to share what’s happening on their screens to better illustrate what they may be referring to. In addition to this, members can also swap between the screens of multiple users to make it a truly collaborative approach. No need to download a separate app/integration for a video call – simply click the link and join the call, making it easier for clients to connect with minimum difficulty. Fully functional desktop, Android and iOS applications for further benefits. Whiteboard feature only available on iOS platforms. Video calling facility may not support enough people for larger teams – even on the paid variants. The paid versions can be rather expensive. Join.me offers a free model wherein three participants can connect with three video feeds. It also offers up to 10 whiteboards on iOS devices. For their paid offerings, they offer Lite, Pro and Business versions – each costing $10, $20 and $30 per user, per month respectively. Join.me offers a 14 day trial of their Pro version. Connecting via telephone or video chat is essential for any office with remote employees. However, it’s also complete overkill for asking simple questions or giving really straightforward information. For that, there’s always chat tools. And, if you are looking to manage your time effectively, it’s necessary to invest in one of these. Chat tools don’t take away the need for video calling tools. And anytime you think that are more complex topic needs to be discussed, just hop over to Skype or Hangouts. Here are a few good team chat apps for you to try out. Slack is gaining popularity as the hippest and most effective tool for quick group or one-on-one communications, and it’s with good reason. Slack allows you to either chat one-on-one or create a group chat where everyone in your team is involved. Additionally, Slack allows you to create a one-off chat within a group chat in case you have a question that only applies to one individual. Slack organizes conversations into channels – each dealing with specific topics relevant to the members present. For example, there can be a dedicated channel for every team, for a small group within a team or even for a cross functional team. There can even be temporary subgroups without creating channels where members can just leave when their job is done. Slack gives you ready access to what has been posted earlier for ready reference. Even the chat history of groups that you have archived or left is still available for future reference. Slack supports multiple formats to be sent as messages – be it links,documents or pictures. This provides a platform to share any relevant information instantaneously. It also supports audio and video calls for up to 15 members in their paid model along with screen sharing. 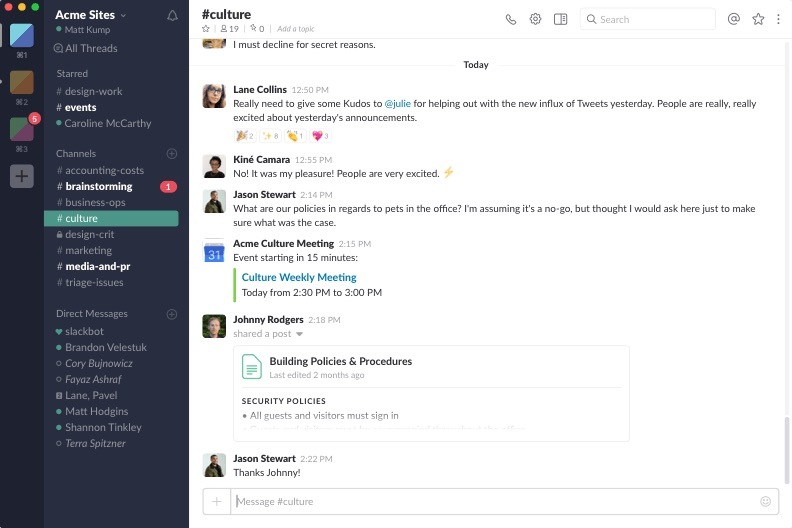 Slack is integrated with hundreds of different platforms such as Zoom, Google Drive, Asana and Todoist. Fully functional desktop, Android, and iOS applications. Call features don’t match the standard of video calling tools. Price per user can make it expensive for larger teams with smaller budgets. Slack’s free model offers five GB of storage, 10 service integrations, one-on-one video calls and the ability to search up to 10k messages. Their paid Standard model costs $6.67 per user, per month and offers unlimited search, unlimited integrations, group calls and screen sharing. 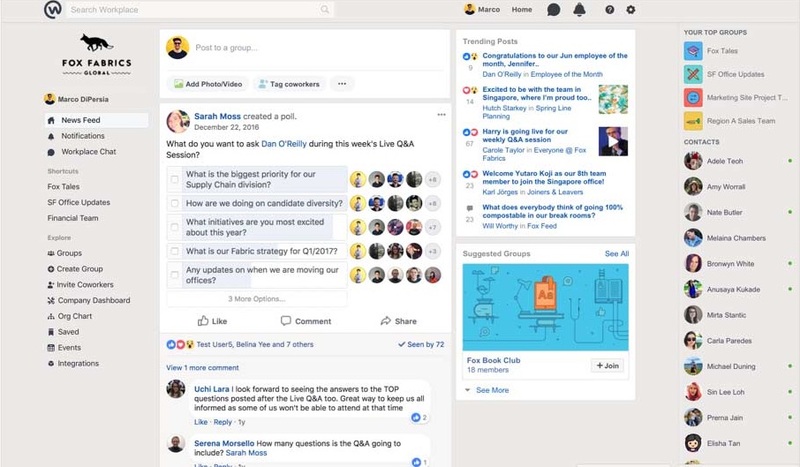 Workplace by Facebook is another revolutionary way to connect your teams together. Essentially, it functions as a joint Facebook account for all your team members. By connecting everyone in your company to your account, you can hold group discussions, post updates about projects, comment and offer suggestions on posts, share files and also participate in voice and video calling. Workplace allows teams to engage actively through groups, where they can assign tasks, share updates and converse with colleagues. There is no cap on the number of groups that can be formed and they all incorporate end to end encryption with unlimited storage. Workplace also provides a platform for people to engage with external teams of clients or suppliers in a safe, easily accessible space. You can have HD video conferences with up to 50 team members through Workplace. This allows you to readily access the people you need in an instant. You can look up individual profiles and team information to get their details and location to connect with them easily. Workplace boasts of multiple integrations such as Google Drive, Zoom and DropBox. Relatively easy to use interface. Has an in-built auto translate to enable seamless engagement with members all around the world. No dedicated project management tool to flag any updates being shared. Lack of extensive data privacy safeguards. Messenger tool requires installing a separate application altogether. Messenger lacks extensive integrations with other software. Workplace by Facebook offers a free model that is suitable for most basic remote teams. For $3/month per user, Facebook offers a host of enterprise features such as administrative controls, monitoring tools and integrations. They also offer a 90 day free trial. You’ve heard the term “keeping up with the Joneses.” While this usually relates to socioeconomic status, it can be fun to apply it to your work situation with remote workers. In other words, it’s fun to use a productivity app to see who is doing what and who is in the lead. IDoneThis is a fun productivity app that is essentially a to-do list on steroids. With IDoneThis, you can enter in all of the tasks your remote employees need to accomplish and watch as incomplete red “x” marks turn to green completed check marks. It’s an easy way to track team progress and keep tabs on how everyone else on the team is doing. Sometimes the best way to manage time is to turn it into a healthy and friendly competition. IDoneThis makes sure your team knows what they have to do by providing regular status updates about their pending tasks. IDoneThis ensures that you know how much progress a team member has made on a task. You can also organize daily tasks, alter the status of deliverables and manage aspects of your team’s workload. IDoneThis also provides you with regular automated reports about the progress your team is making. 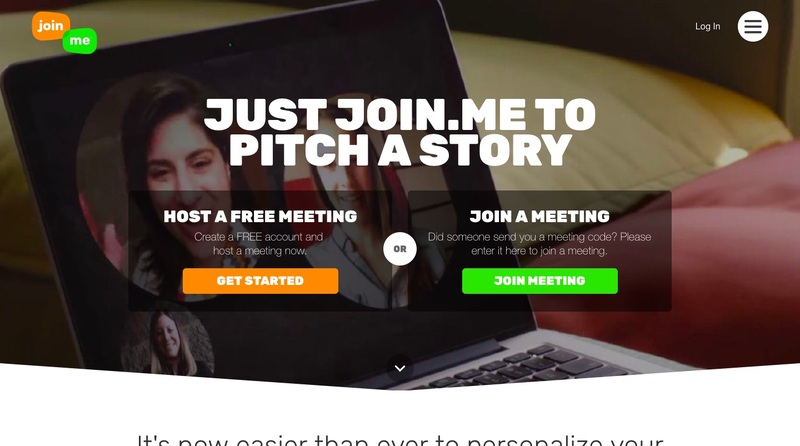 IDoneThis is integrated with other tools like Slack, Email, Github, Teamwork and Zapier. Simple, yet effective tool for tracking status updates on tasks. Creates healthy competition by allowing team members to note down how far along their peers are. No option for adding multimedia based tasks such as photos and videos. No Android or iOS mobile app. IDoneThis offers four different plans ranging from $5/month per user for email support and basic reporting features, to a 40$/month per user plan with enterprise-level reporting features and bank grade security. They also offer a free three day trial for all their plans. Todoist is a super straightforward to-do list app that anyone can use. When you log in to Todoist, you can add tasks, label them, assign a due date and then filter by tasks that are assigned to you, assigned to someone else, marked with a special priority, etc. You can also view your tasks by the day or that are due within the next seven days. Todoist is free if you are using the basic features, but if you are managing a large team, it’s worth the premium upgrade fee to get all the features. 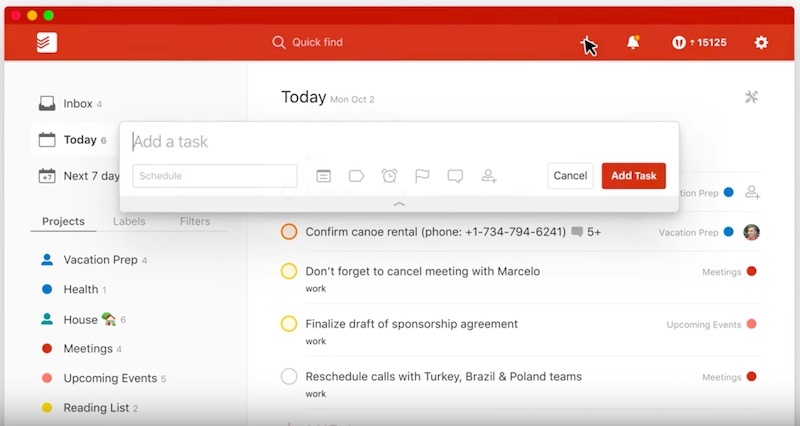 Todoist makes it easy to organize tasks and assign them to each team member. You can set sub-projects as well as highlighting which items have priority. Multimedia supported notes can be added to tasks along with enabling a comment section to address queries. Todoist also offers you the ability to create recurring tasks for team members. Todoist allows you to set up labels and filters to make it easy to sift through various tasks. You can also set certain templates and filters to ensure uniformity. It also notifies you when a deadline is approaching or if a new task has been assigned. Todoist is integrated with over 60 apps such as Google Drive, Mailbird, Slack and Time Doctor along with plugins on various browsers. Simple UI for ease of access. Multiple shortcuts to increase efficiency. Can add tasks and duties directly from emails. Fully functional Android and iOS apps. Most of the features, such as labelling, commenting and setting reminders are limited to the Premium version. Todoist has a basic free version anda feature-laden premium one which costs $3/month per user. You can save 19% if you pay yearly, where it works out to $29 per user. They also offer you a 30 day free trial. It may seem strange to include a cloud storage app in an article about the best time management apps, but it’s perfectly relevant. Can you imagine how much time your remote workers would waste if they didn’t have a cohesive go-to app for file sharing? And, heaven forbid they try and email all the files to you. Many of the apps listed above will include a way to share files, but you may need a backup or may want to use a more trusted file sharing app like Dropbox or Google Drive. Dropbox is a great application for easy and safe file sharing and cloud storage. Being one of the most commonly used storage apps in the world, most remote workers are already aware of its functioning. Upgrading to Dropbox Business is an ideal choice as it lets you sync, file share and collaborate with ease – making remote collaboration that much easier. Dropbox offers varying amounts of storage to cater to your needs, with the Dropbox Business version giving your team up to 2TB of Cloud storage space. Dropbox allows team members to readily access information present in team folders along with providing a facility to leave comments. Any edits made will be automatically synced so that each member has the latest version of the document. Dropbox allows you to create user lists to make it easier to assign tasks and duties. Dropbox also provides a team activity tracking feature to ensure that your team members are performing efficiently. Dropbox allows you to easily share documents externally – even if the recipients aren’t Dropbox users. In addition to this, all Dropbox documents automatically sync across all your devices – providing you with ready access at all times. Countless integrations across a variety of fields such as Hootsuite, Asana, Zapier, Slack and Canva. Easily accessible storage across multiple platforms. Free model has no administrative tools and real-time collaboration. No secure encryption for data at all times. Only supports adding separate files – not entire folders directly. Dropbox Business plans start at $12.50/month per user (min 5 users) for their Standard model that offers 2 TB of storage space along with easy-to-use collaborative tools. Their Advanced model costs $20/month per user (minimum five users) with advanced administrative controls, SSO Integration and no cap on storage space. Google Drive is a great free option for managing a smaller team of remote workers. Drive allows you to share files, collaborate, edit, comment on documents and more – making coordination on documents far easier. There is also an added measure of security and control by being able to control who has access to certain documents. All files stored on shared Google Drive folders are automatically synced on all platforms – be it desktops, tablets or smartphones. In addition to this, the G Suite version of Drive offers you higher cloud storage capacity for all your files. 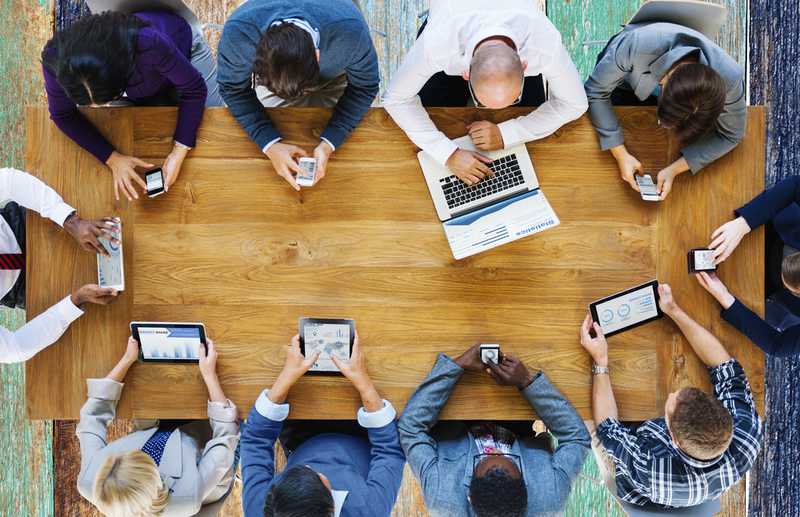 Google Drive offers real time collaboration support for team members as standard. This means that multiple members can work on the same document at the same time – in Google Docs, spreadsheets and so on. They can also leave notes and comments for feedback. Drive also offers the option of allowing selective individuals in a team to access certain files in Drive. 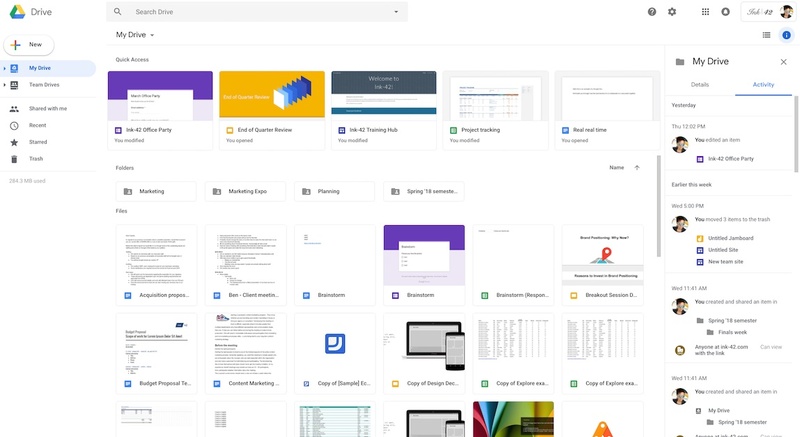 Google Drive makes it extremely easy to share files with individuals along with the ability to make a file available offline for personal editing and access. In addition to being fully compatible with all other Google Docs apps such as Spreadsheets and Forms, Google Drive has a host of integrations across multiple platforms such as Clickup, Zoho and Slack. Added privacy features such as limited access to certain files along with Symantec and CypherCloud-backed security. Multiple inbuilt templates for all kinds of documents. No restriction on the file size of a particular document. Only 15 GB of cloud storage offered in the free variant. 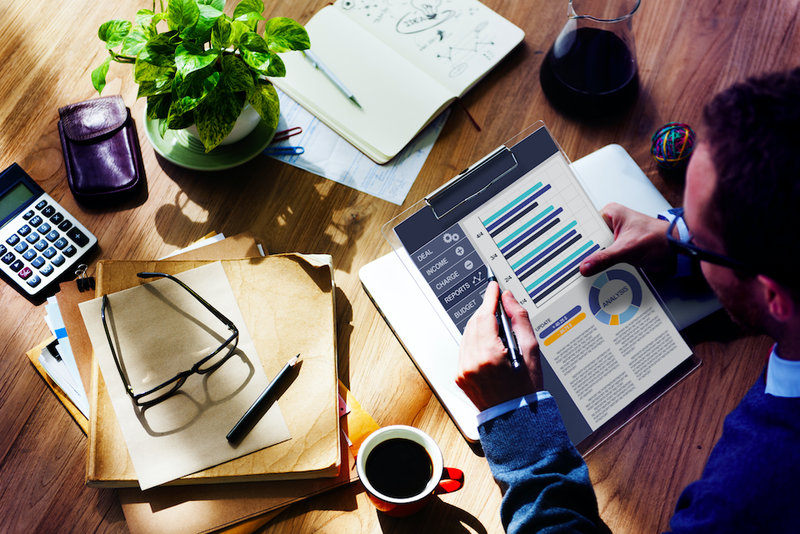 Lack of extensive administrative tools to manage team members. While the free version of Google Drive offers 15 GB of storage space, G Suite Business offers you unlimited storage access on both Google Drive and Gmail for $10/month per user (accounts with fewer than five users get 1TB per user). This comes with a host of other benefits on other Google Apps. With the right combination of these time and task management apps, you’ll help your remote workers stay organized, work more effectively, and be more productive than you ever imagined. 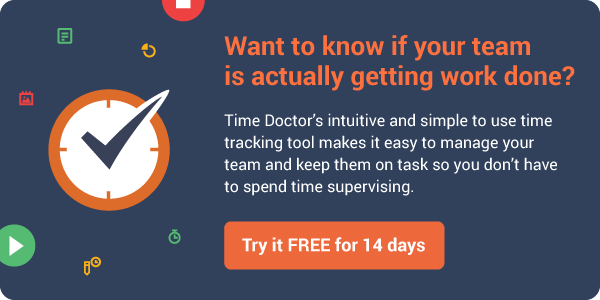 To get a glimpse of just how much these tools could help you and your team, why not sign up for Time Doctor’s free trial? Which app do you think will be of most use to you? Let us know in the comment section below. Speaking of time management and increasing productivity, how about TimeGurus? It tells you how much time you spend on your phone daily, and specifically for each app. I would also recommend NearMinder, which is the only app to send you reminders based on your proximity to your contacts! With this app you can easily set reminders for things you have to do when meeting people and get notified when these people are nearby. It also works for location-based reminders. I use iSmart.Life to improve my productivity. Thanks for sharing. The tool that I use is Time Manager. It’s about getting maximum productivity from your available time. It’s a useful application, with a user-friendly interface. Thanks for this useful article, Greg. I think you should also add WebWork time tracker in the list. 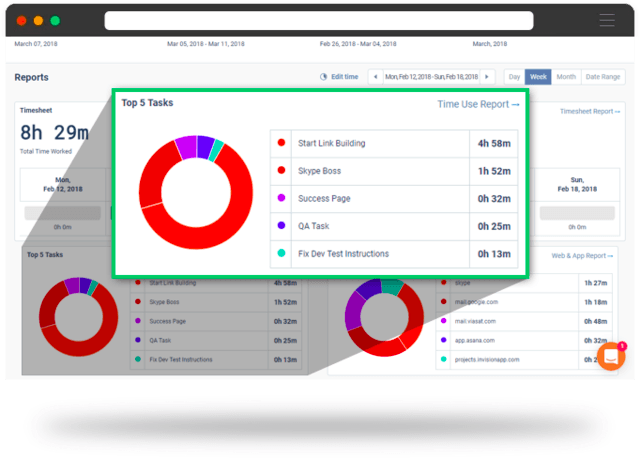 It is a great time tracking and employee monitoring software. I have been using it in my freelance job lately, to track my time for generating more accurate invoices for my clients and managing my projects more efficiently with its PM dashboard. It offers a wide range of productivity reports based on my activity, so it is very helpful in boosting my productivity levels. Thanks for sharing. The tool that I use is Fanurio http://www.fanuriotimetracking.com. It helps with the less appealing aspects of freelancing like invoicing and keeping track of time. It’s a useful application, with a user-friendly interface. Great list! I’d like to add one more in your list of time tracking is ProofHub. ProofHub’s online time tracking software will help you to record every hour spent on each task and project. You can keep track of the time spent on tasks by either making manual time entries or by using the timer to bill the clients accurately. Simple-Tasks.com helps you to organize all your customers’ schedules at one place and all you team members can have the view of the daily/weekly agenda and you will be all reminded about the incoming tasks. If you have any daily/weekly/monthly repeating tasks you create the rules which will automatically create these tasks for you and remind you accordingly. Beside all that it is Simple-Tasks.com to use.